Thanks to scientists at the SLAC National Accelerator Laboratory, audiences can hear a 200-year-old opera by composer Luigi Cherubini in full for the first time in centuries. The scientists blasted X-rays at the damaged musical score to peek at the musical notes hidden beneath a layer of smudgy black. At first glance the beautifully bound 1797 Luigi Cherubini opera Médée looks like an impeccably preserved relic of opera's golden age. However, flip to the final pages of the aria "Du trouble affreux qui me dévore" ("The terrible disorder that consumes me") and you see the problem: Thick smudges of carbon completely black out the closing lines. Now, for the first time in over 200 years, Cherubini's most famous opera can be heard in full, thanks to physicists from the SLAC National Accelerator Laboratory. The scientists used X-rays to glimpse at the lost musical notes concealed under the carbon smear. "It was amazing to be able to see the complete aria," said physicist Uwe Bergmann, the interim director of the SLAC Linac Coherent Light Source. "For me, uncovering the composition of a genius' work that had been lost for centuries is as thrilling as trying to uncover one of the big secrets of nature." Cherubini was widely considered to be one of the greatest composers of his time. Even Ludwig van Beethoven held him in high regard, admiring Cherubini's ability to "weave his polyphonic virtuosity, classical stylistic polish and a truly Romantic sense of drama into music of extraordinary depth and dramatic power." When Cherubini first performed his operatic masterpiece Médée, the critics scoffed that it was simply too long. The legend goes that Cherubini, in an act of defiance, simply blacked out the closing lines to make the piece shorter. For centuries, the piece was performed in its incomplete form. A visiting scholar at Stanford from Germany heard about how SLAC scientists uncovered hidden text in Archimedes' writings and wondered if the same process could be used to restore Médée. A few email exchanges and tests later, the musical manuscript was in a custom-built frame on its way to the Stanford Synchrotron Radiation Lightsource (SSRL) at SLAC. The synchrotron lightsource used to restore Cherubini's opera began as a byproduct of one of the accelerators at SLAC. Electrons moving at nearly the speed of light fire off a bit of high-energy light called an X-ray as they zip along curves in the accelerator. These X-rays are then collected, sorted and focused into a beam scientists can use to run experiments. When this beam of intense X-rays bombards a bit of matter, such as the ink on a musical score, a few electrons in the material get knocked out of their energy orbits around the nucleus of their atoms. The holes they create get filled by electrons from a different energy orbit, and in the process secondary X-rays, called fluorescence, with exactly that energy difference, are fired off. By setting their sensors to look for X-ray energies associated with zinc and iron in the inks on the paper, the scientists were able to reveal the blacked-out music. These excited electrons later fall down to their original, lower energy orbits and fire off the difference in energy as an X-ray. Since the energy difference distance between orbits is unique to each element, the fluorescence X-rays coming off a material can act like an elemental fingerprint. When Cherubini composed Médée in 1797, ink contained a large amount of metal. 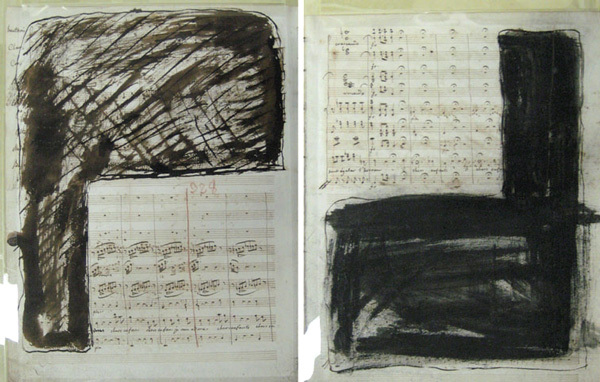 In the case of Cherubini's manuscript, the handwritten notes were written with iron gall ink, which, as the name suggests, contained a large amount of iron. 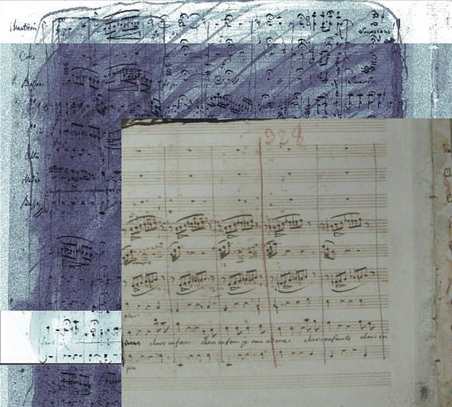 The manuscript pages Cherubini wrote on came preprinted with the horizontal lines of the musical staff. These printed lines contained a high level of zinc. By setting their sensors to look for X-ray energies associated with zinc and iron, the scientists literally had X-ray vision: The charcoal smudges – and even the paper itself – mostly contained carbon and would be almost completely transparent to the X-ray beam. The scientists focused their X-ray beam down to 50 microns across – smaller than the width of a human hair. Slowly the scientists scanned the document line by line, moving left to right and right to left as the beam worked its way down the page. Each side of the page took about eight hours to scan. "It's similar to a dot matrix printer," said Samuel Webb, a beam line scientist at SSRL who ran the experiment. "Whenever we saw iron we would put a little digital red ink blot down, and whenever we saw zinc we'd put a little green dot down." Webb, Bergmann and Roy Wogelius, a geochemist from the University of Manchester in England who was visiting SLAC at the time, quickly saw the hidden notes emerge on their monitor. However, they ran into a problem: The paper itself was invisible to the X-ray beam, meaning they were getting notes on both sides of the page at once during their scans. Luckily someone came up with a simple solution. A musical note is typically made up of a vertical stem attached to a circular head. In Cherubini's case, the note heads consistently attached to the right side of the stems. By going through by hand and seeing which heads leaned which way, the single image of jumbled notes became two distinct pages of crisp musical notes. For the first time in over 200 years, Cherubini's masterpiece was complete. "We are used to scientific experiments where you get the data and have years of work before you can make any sense of it," said Bergmann. "In this case, we ran the project overnight and in the morning we were done. You could read the score – it was amazing." Now anyone can experience Médée as it was originally intended to be heard. When the restored sheet music became available, the liner notes included a special acknowledgement thanking the physicists at SLAC.